Created entirely at Longcross Studios in Surrey, England. Famous ballet dancer Count Andrenyi [Sergei Polunin] does not appreciate the constant paparazzi! The train was pulled in and out of the station on a mile of track. It was built and dressed to withstand the movement of a real train. 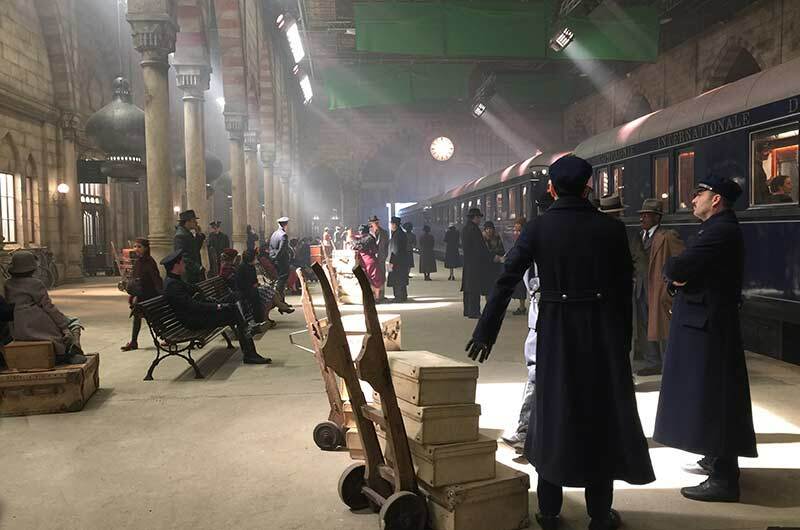 It was a fantastic dressing advantage to be able to stand inside all of the completed carriages after they were dressed to see the view onto the platforms and vice versa...Especially as Kenneth had planned vast tracking shots along the whole platform, inside and outside of the train! 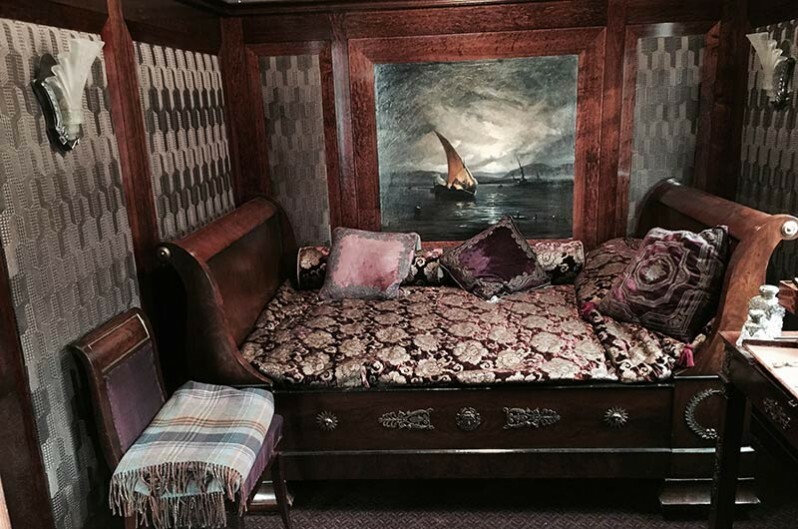 This was one of several salon carriages we built and dressed. 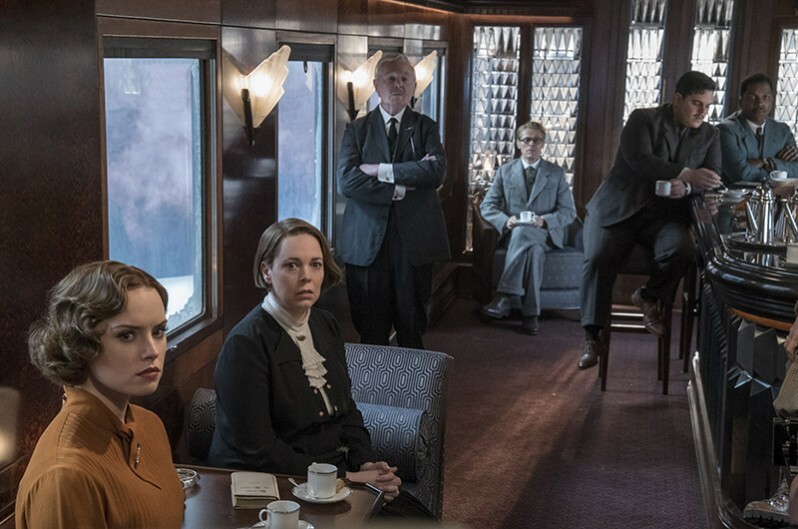 Daisy Ridley, Olivia Coleman, Derek Jacobi, Willem Dafoe, Josh Gad, Leslie Odom, Jr.
Kenneth Branagh wanted a clean stylish look for the dining sets in all the carriages. So it's crisp minimal look was intentional. 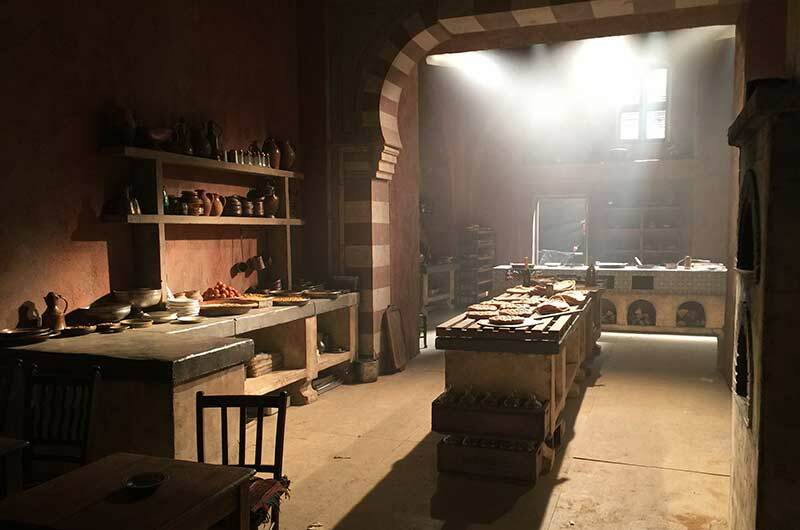 We had constant flows of food and drinks from the kitchen and open hatch in the background when we shot all the dining room scenes. 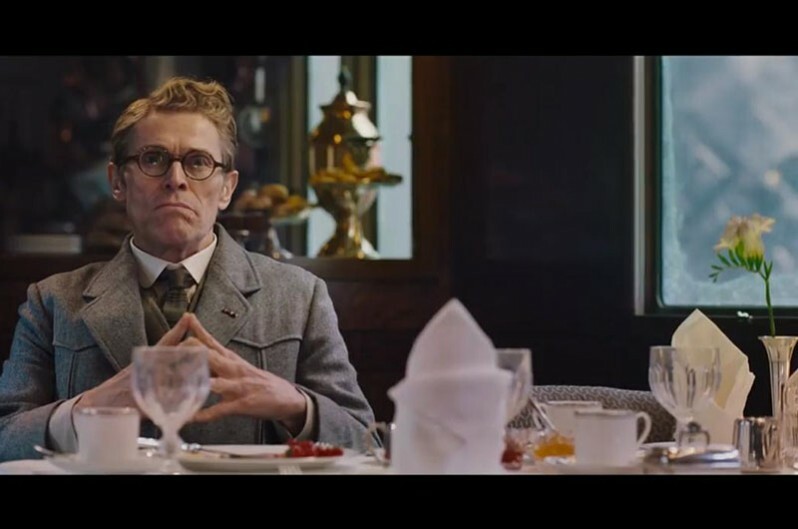 A lot of the extras were sent on a course at Claridge’s, and we had a special advisor who came onto set to help. 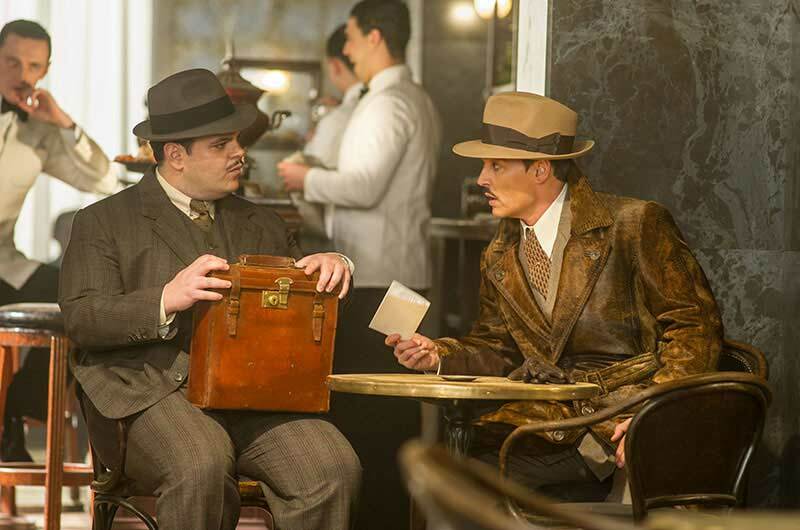 The baggage car was full of the main cast’s luggage, all purchased and carefully selected for each character. 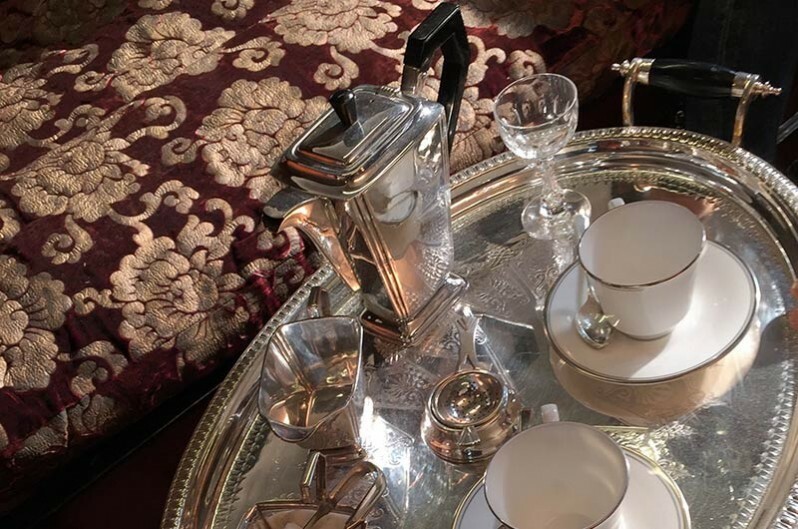 Unlike the US system, in the UK, the set decorators also are in charge of all action props & hand props. I had buyers and assistants on full time just to fulfill the requirements for each of the characters, and all other hand and action props. 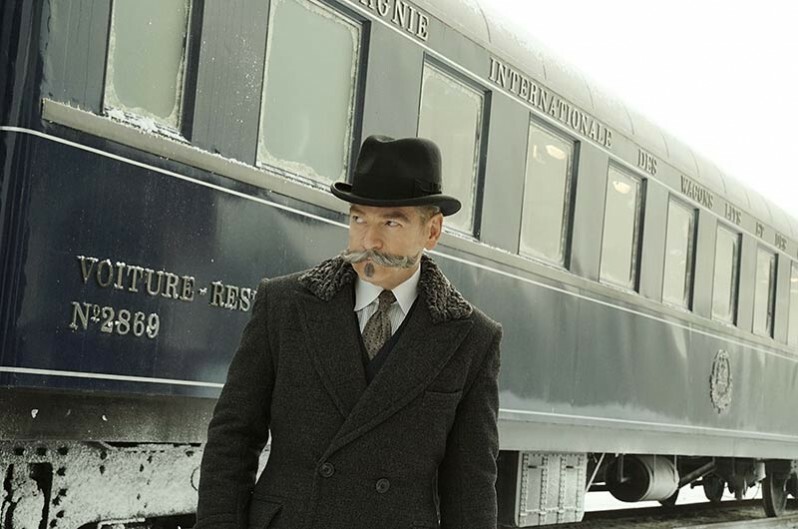 In the most timeless of whodunits, MURDER ON THE ORIENT EXPRESS follows renowned detective Hercule Poirot [Kenneth Branagh] as he attempts to solve what would become one of the most infamous crimes in history. 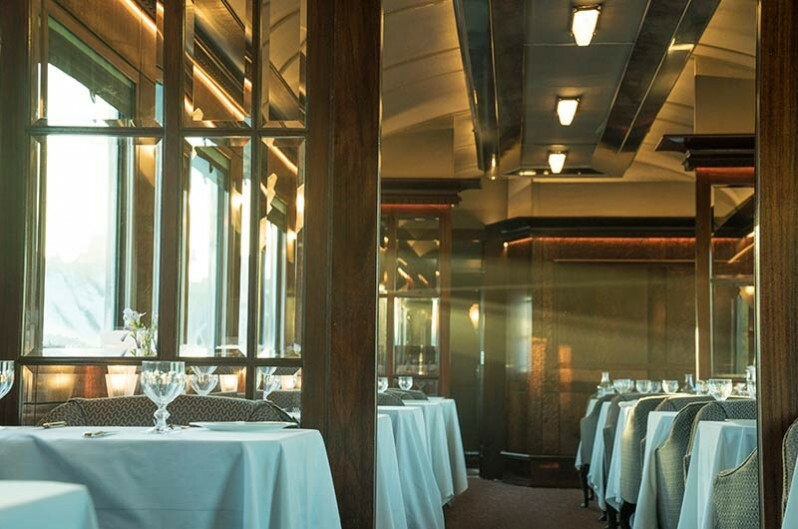 The Orient Express long-distance passenger train service was established in 1833 and connected Paris to Istanbul. 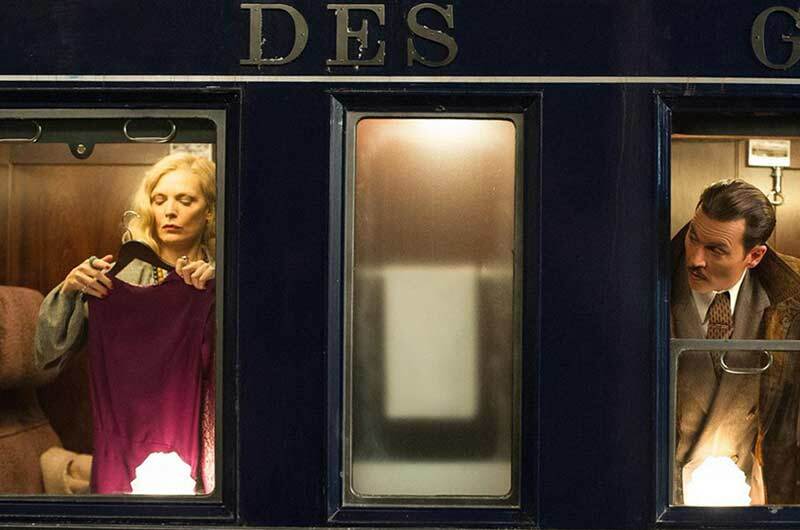 It symbolized the glamour of travel and its undeniable elegance and prominence within the story makes it stand out as one of the main characters of the film. 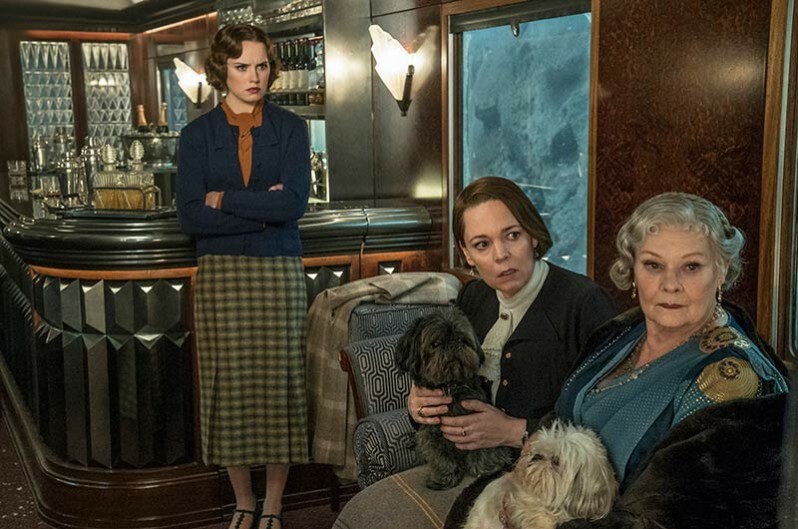 A fully moving train, dressed inside and out, and comprised of a locomotive, a tender and four complete carriages was built and able to move along the nearly one mile of track that was laid down at Longcross Studios in Surrey, England. The locomotive alone weighed about 22 tons, with each additional carriage weighing in at around 25 tons. 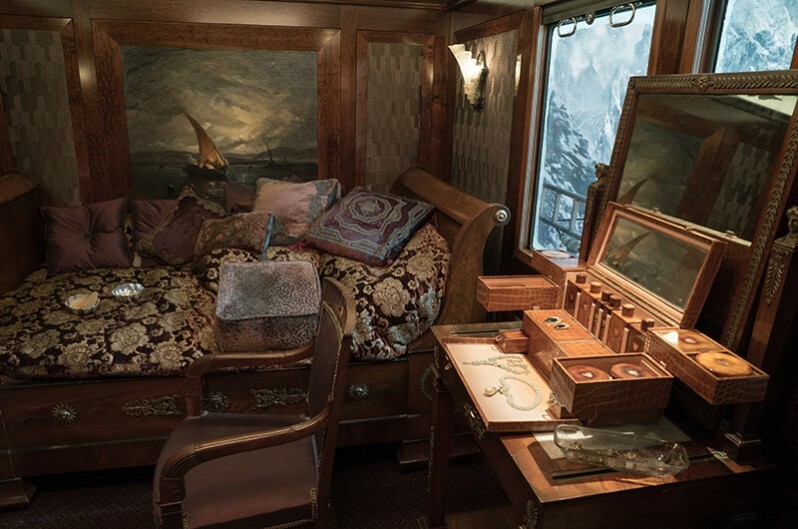 All of the interiors of the carriages, the dining, salon, storage, baggage and sleeper cars were also constructed a second time, with lavish interiors and floating walls to allow filming inside. cutlery, crockery, glassware and the luggage. 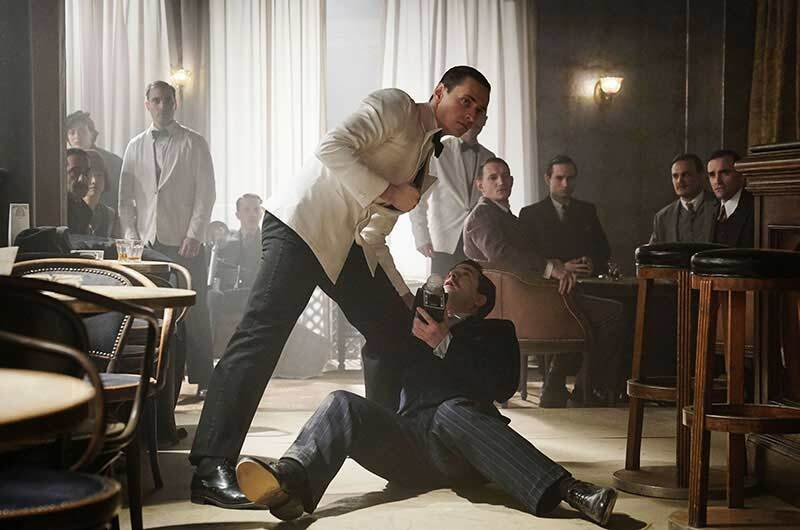 Poirot's luggage included a grooming kit for his legendary moustache, which was designed in order that Poirot could complete his precise grooming process anywhere in the world. 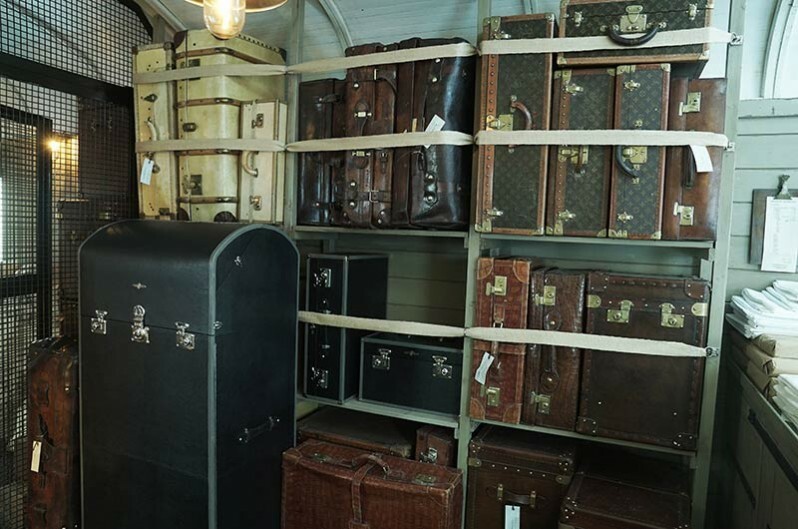 Alleway recalls, “Kenneth Branagh, who plays Poirot, had a very particular idea of what his luggage should be and look like, so we had it all custom made. We sourced a special prop company, Anarchy, to make all these pieces. It took many months and many meetings to agree on what they should be. 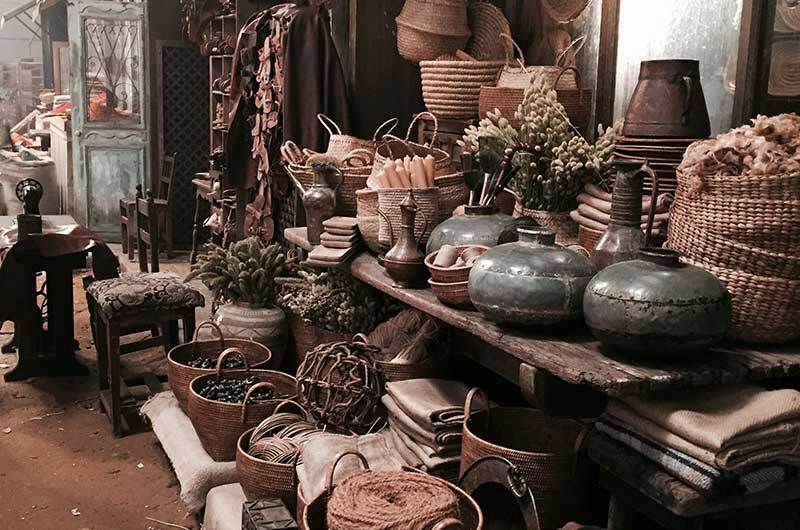 The interiors opened out like Aladdin's Cave and were very intricate, fitted to hold every unique piece." 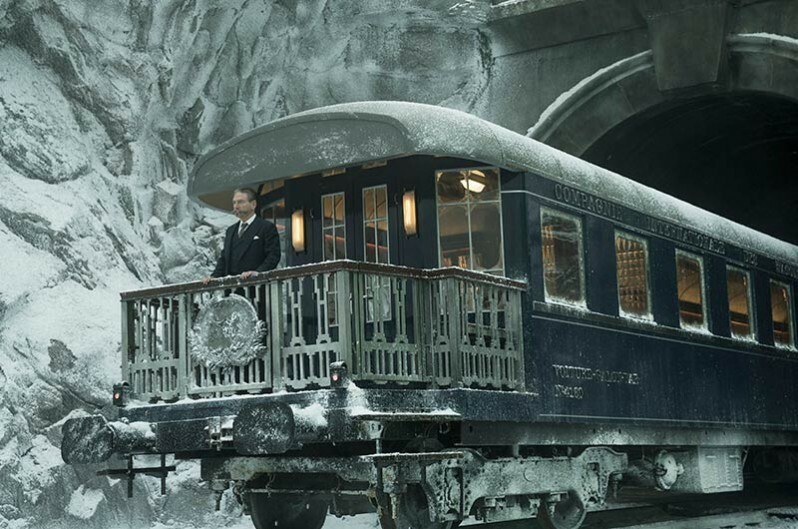 In an attempt to keep the experience as real as possible for the cast, the filmmakers shot hours of footage of a train travelling across an expansive mountain-scape, which was then digitally stitched together and played on 2500 LED screens wrapped around each individual carriage to give the impression of a moving train. With the addition of hydraulics and air bellows beneath each of the carriages, the movement of the train along the track could also be simulated. Caught up in the moment, many of the cast really felt that they were on a moving train and sometimes wobbled when they came off set. 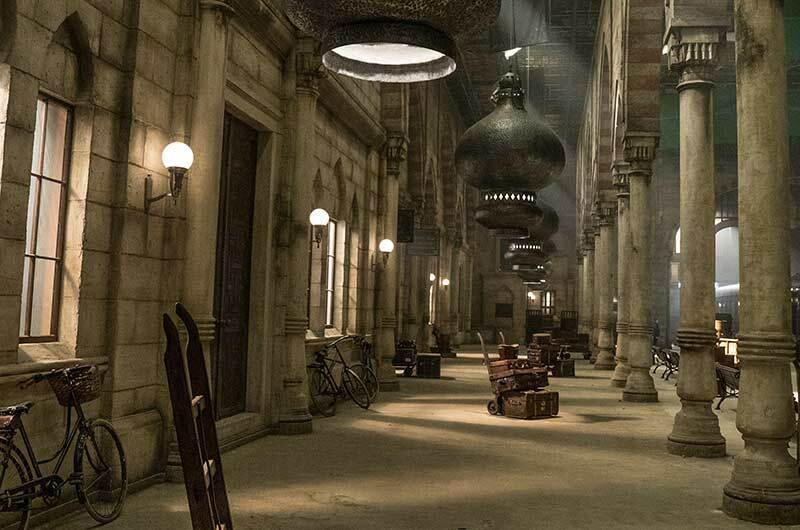 A devotee of the picture definition and unrivalled depth that shooting on 65mm can afford, Director Kenneth Branagh and team shot the film using the last four 65mm Panavision cameras in the world. 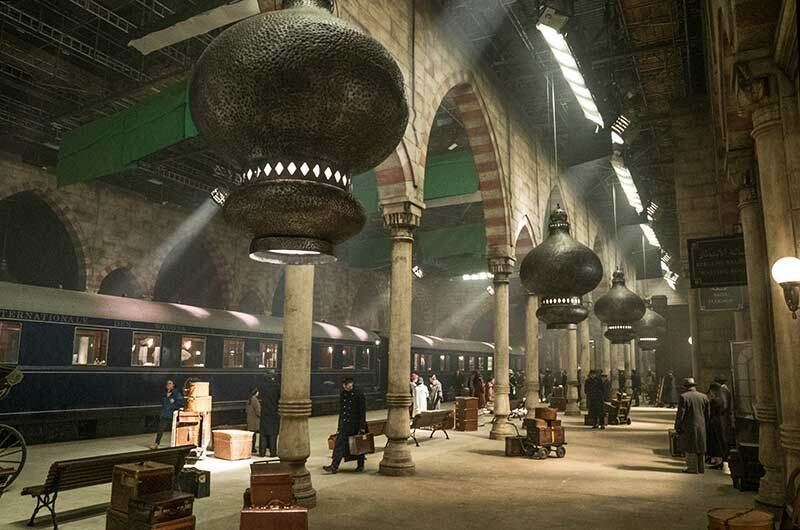 The breathtaking Stamboul Station, Istanbul from which the Orient Express departs on its journey to Paris was built on the largest soundstage at Longcross, the set filled with huge columns, exotic lighting and comprised of two tracks with platforms on either side. Because Longcross was originally a factory for building and testing tanks, we had an advantage as the stage had two big doors at one end, so we were able to build the track the full length of the stage, and indeed take it out of the stage and into the car park. We were even permitted to close part of the studio road, in order to pull the whole of the train out of the station as it set off on its journey. An extraordinary sight to witness! Alongside Stamboul Station, we built and dressed several other train stations on the back lot at Longcross. 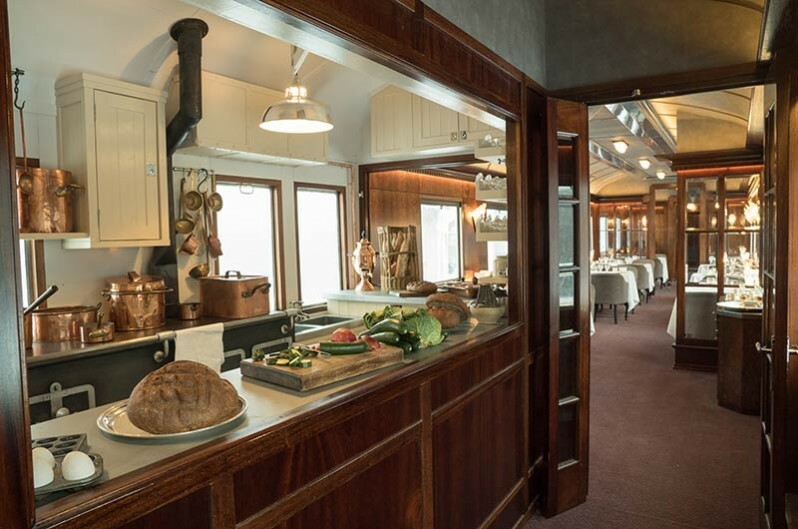 These were stations on the Orient Express journey where the train stopped and loaded with sumptuous goods. 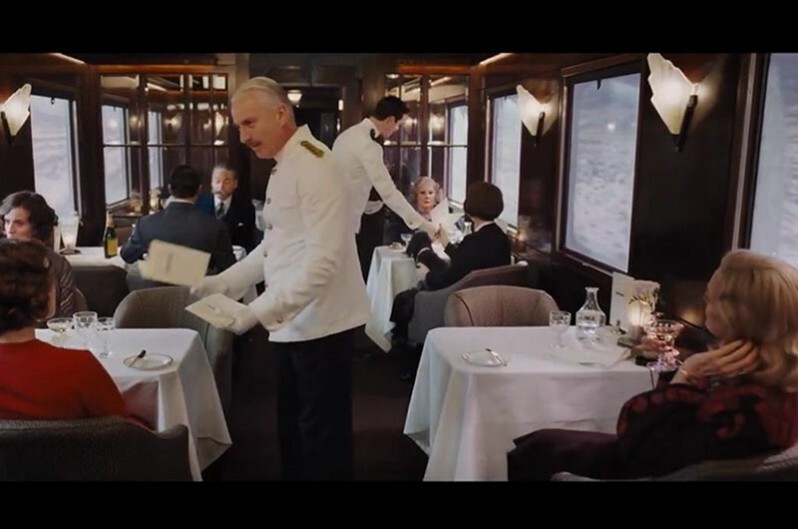 The train carriage compartments, suites, corridors, salon, dining car, storage and kitchen areas were actually built multiple times to accommodate shooting in the different environments. We had a train built and dressed to shoot the exterior and interior on the vast viaduct set and all the station environments. 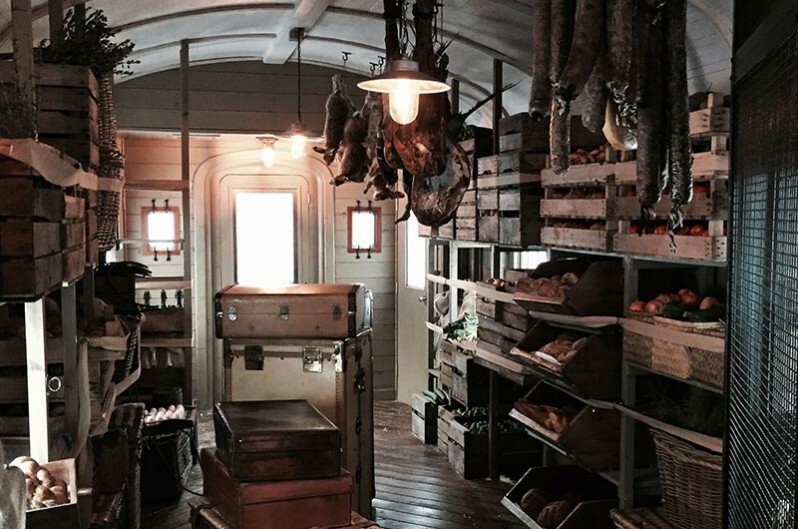 We then built and dressed the interior carriages in the studio that were used for some of the interiors shots. 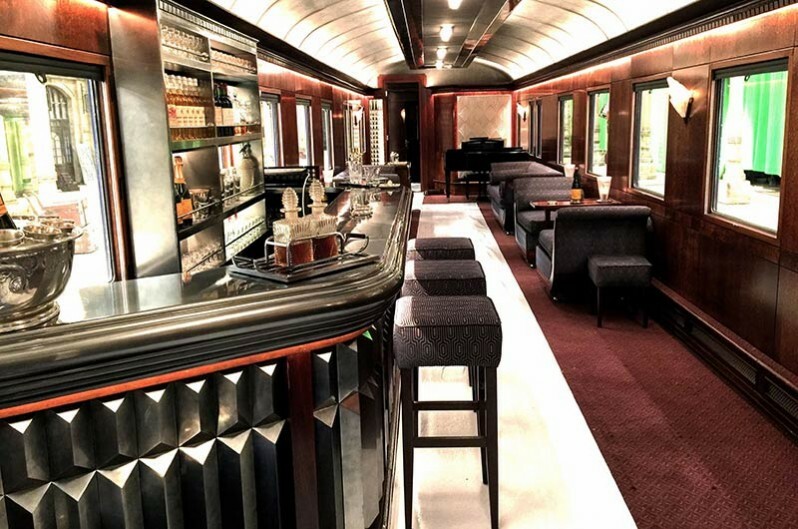 All the suites and compartments were built as part of the composite train as well, but also as individual sets on stage, so they were made slightly bigger and had floating walls. 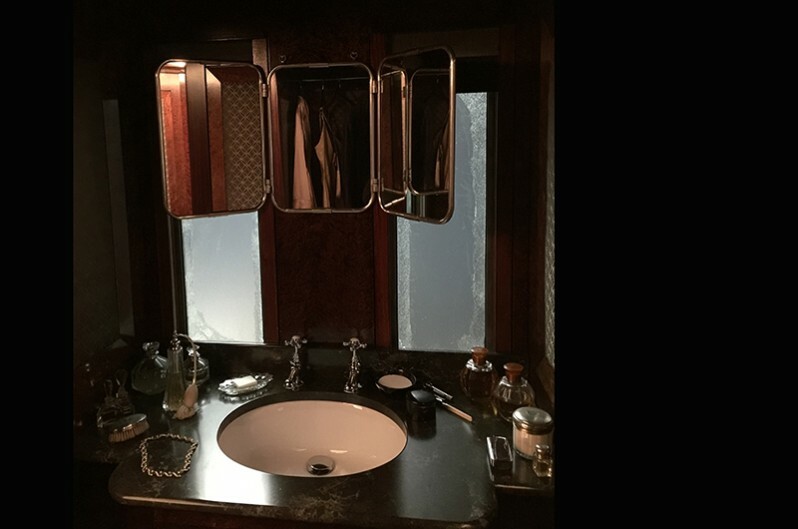 All compartments and suites were dressed to suit character and status. The ‘viaduct train’ was a full scale tender with four carriages. This set was on top of a massive 100-ft viaduct platform built over months on the back lot of Longcross...complete with sculpted mountains...for all the scenes shot after the train has been hit by an avalanche. The train was craned onto the viaduct and then we dressed it! This was a huge logistical challenge. 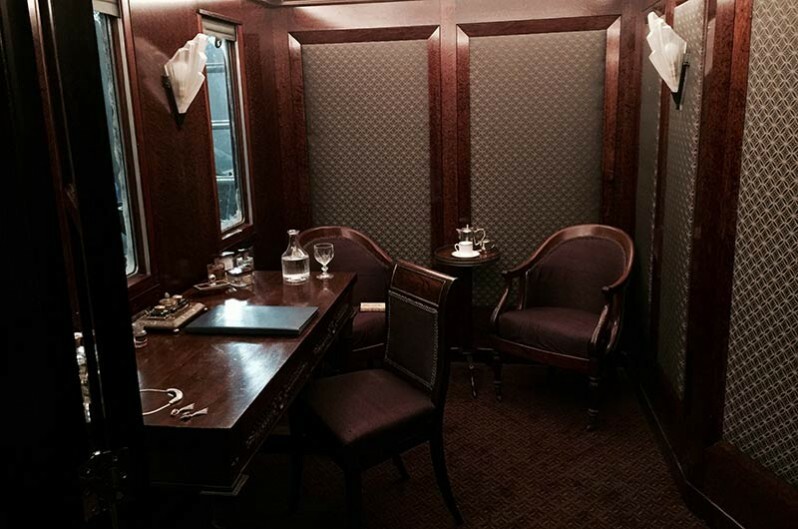 The train was dressed for the full interior—with all corridors, kitchens, salon, dining room, compartments and storage—which took exceedingly detailed planning. Therefore, anything that could be fixed onto the train for this exterior and interior set was dressed before the train was craned onto the viaduct! 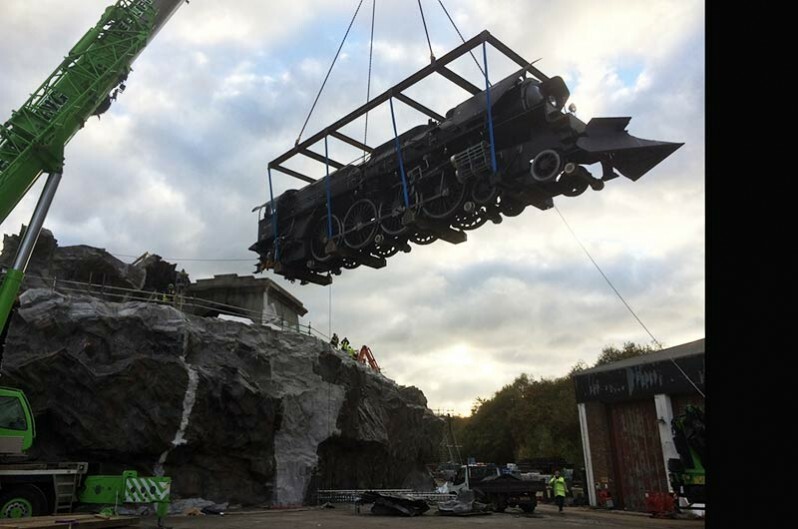 However, most of the dressing was done after the train had been craned up onto the 100 ft high set, which made the process quite a challenge. The set dec team included a buyer who was just dedicated to tender engine and exterior train parts. An enormous amount of research went into sourcing anything we could mold, copy or use for the exterior engine and all the carriages. 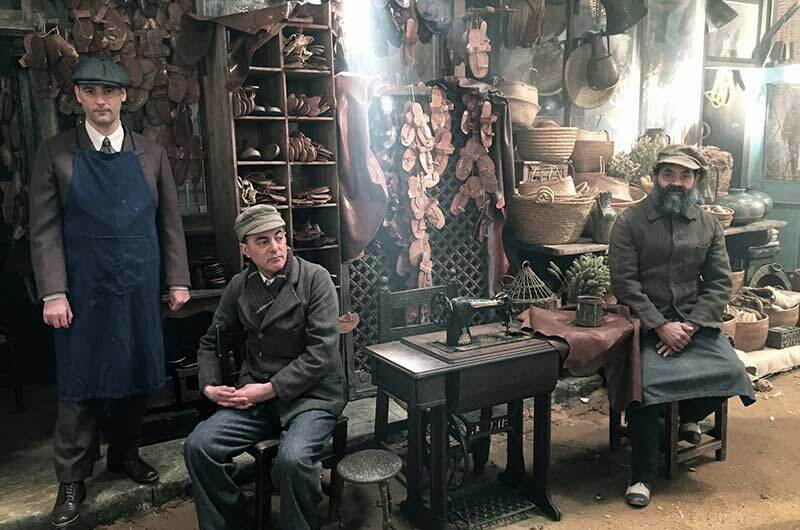 We sourced beautiful 1930's ironmongery and period lighting fittings, which were then manufactured in great quantities by our propmaking workshop. One of the biggest sets outside of the train was the Arasta Bazaar in Istanbul, which was built on one of the larger stages at Longcross. We dressed long, wide streets with shops, traders, restaurants and the Orient Express check-in area. We flowed from the street into the large Arasta Bazaar restaurant, which was divided into 5 different areas: the open café, the bar, a restaurant, the local Turkish café area and then several kitchen spaces where all Turkish delicacies and baking took place. 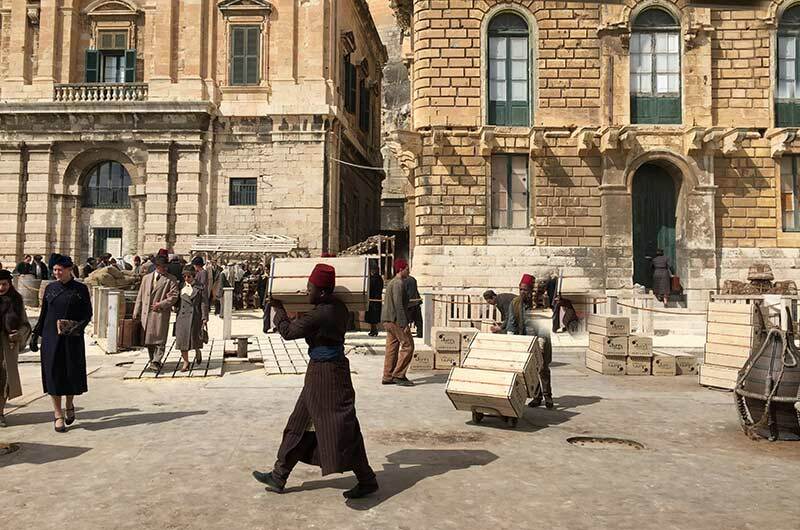 All the sets were built at Longcross with the exception of The Wailing Wall and the Jerusalem Port, which were built and dressed on location in Malta. 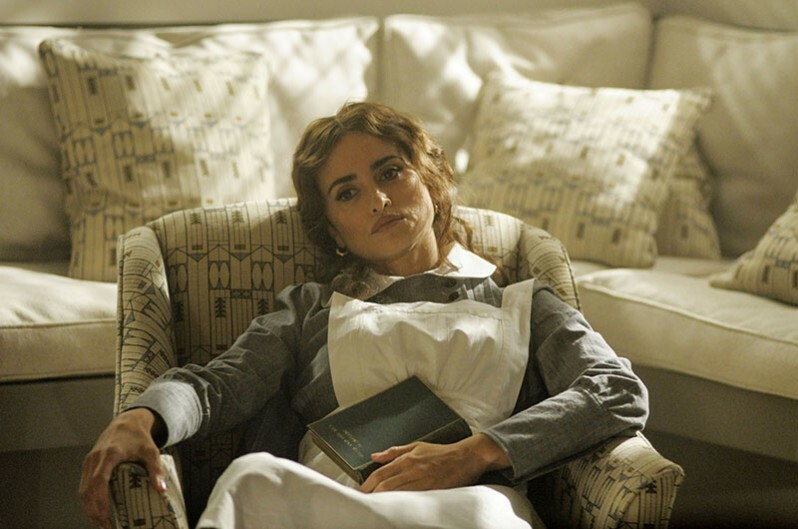 Poirot’s Jerusalem hotel bedroom, lobby and reception were planned to be filmed on location in Malta, but for scheduling reasons, we ended up building them all at Longcross! Sadly, the large hotel lobby and reception never made it into the final film. 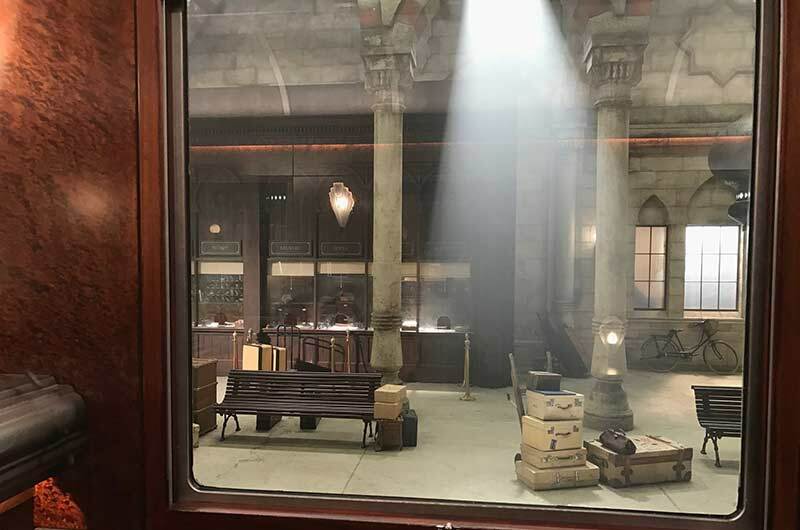 Other large sets were constructed for the all the flashbacks to include the Frank Lloyd Wright style Armstrong mansion, a New York street and a courtroom. 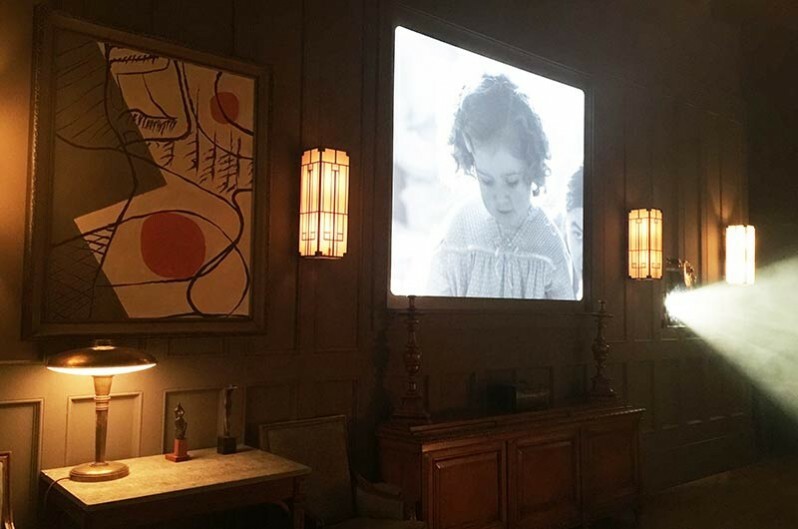 Daisy Armstrong’s bedroom in the flashback sequence was a small set compared to the rest of the film, but it carried the weight of being shown in black and white. Most furniture for this set was sourced through dealers of American Shaker-style furniture. All the toys were found through toy fairs and antique shops, so every detail was correct for period and style. I tested all the fabrics and colors in black and white before committing to anything and had some of the furniture painted to create more contrast. 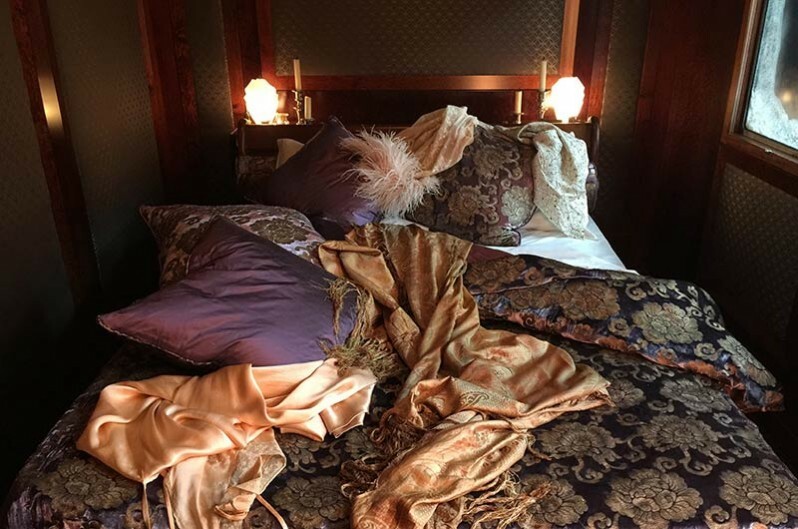 The Armstrong mansion was a large set and all the furniture was carefully considered for its scale. It was a balance between dressing it to give it a richness but also at the same time a minimalist and oppressive feel. It, too, had to work in color and for black & white. I designed the Lloyd Wright style wall lights and modernist paintings to give it a unique modernist feel. I started the film after I received a call from Production Designer Jim Clay, asking me to come in for a meeting with him and Kenneth. 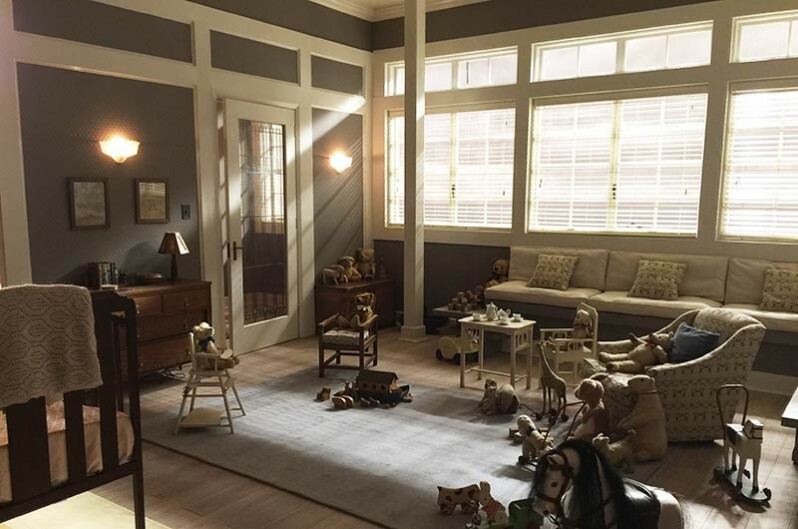 Unfortunately the original Set Decorator, Caroline Smith, had to leave for personal reasons. 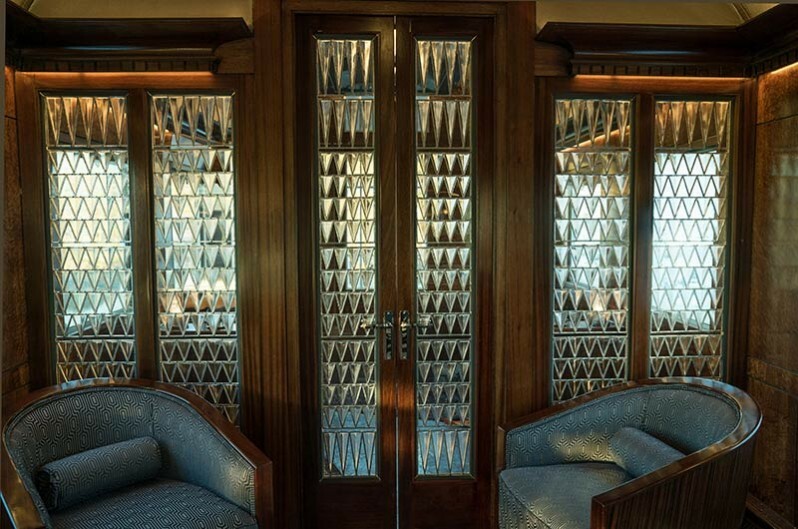 Jim and Ken were both quite clear that they wanted to steer away the more decorative Art Nouveau style and edge towards the more geometric patterns of the Art Deco period. Luckily, I had researched this period many times before and was armed with a large amount of research material and resources! I genuinely think this was an amazing piece of production design by Jim and an extraordinary logistical feat by Dominic Masters the Supervising Art Director, and the Art and Set Dec department. 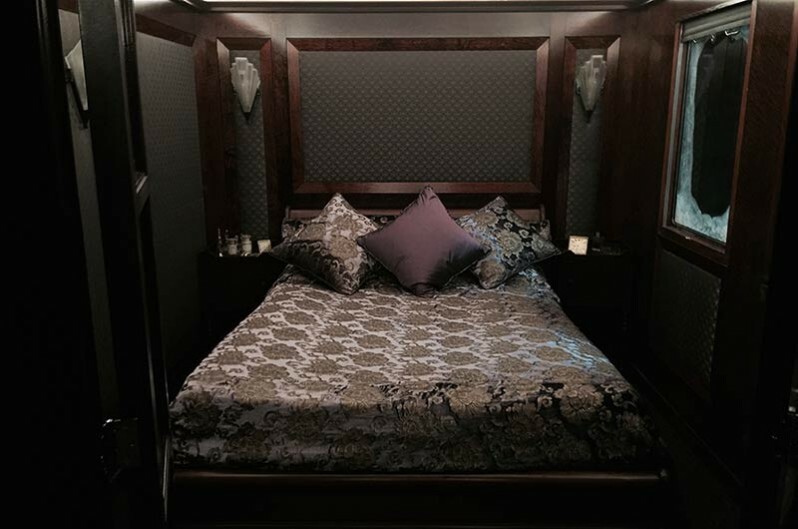 *More details from Set Decorator Rebecca Alleway SDSA about the photos in the gallery above! By the time we dressed this one on the LED sound stage, we had already started shooting on the salon carriage on the viaduct train, so we knew exactly what worked. Various antiques were dressed to shot, like cocktail trolleys and trolleys full of beautiful glass & silverware. 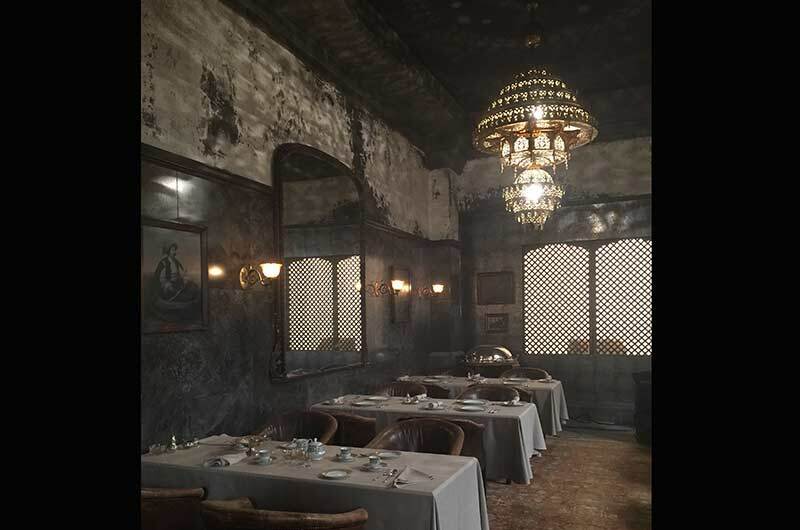 The dining tables were manufactured with a leather inlay, in case we saw any of them without the tablecloths. 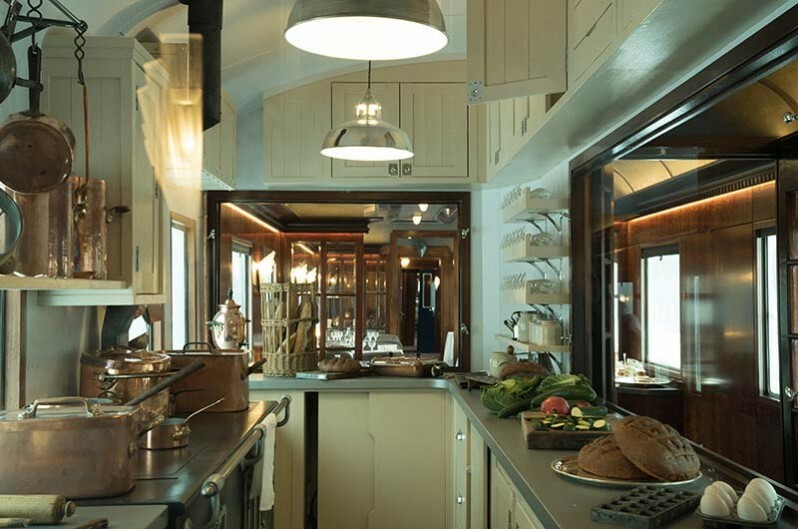 They were permanently fitted into the train, which was one element we didn't have to redress, although we had several ‘dining carriages’ being shot on at the same time on different stages at Longcross! 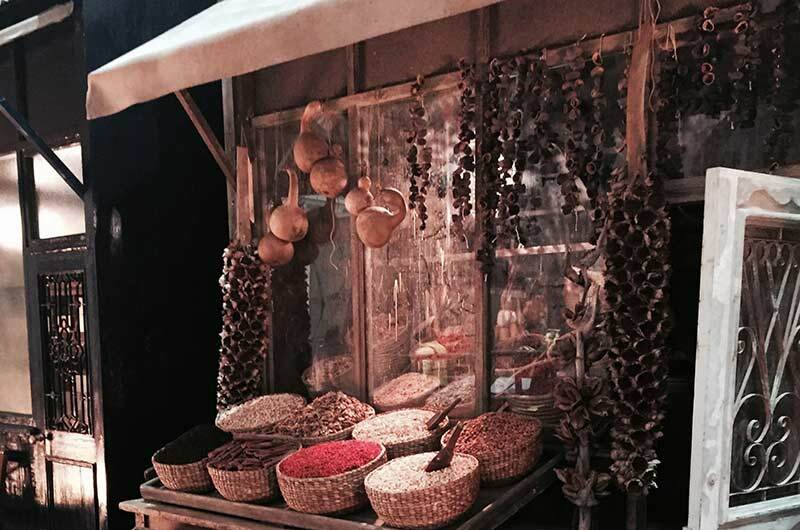 We originally had big scenes with ‘Orient Express staff and workers’ loading all the amazing produce for each of the stops it made around Europe. Every crate was carefully selected to reflect the counties unique ingredients. 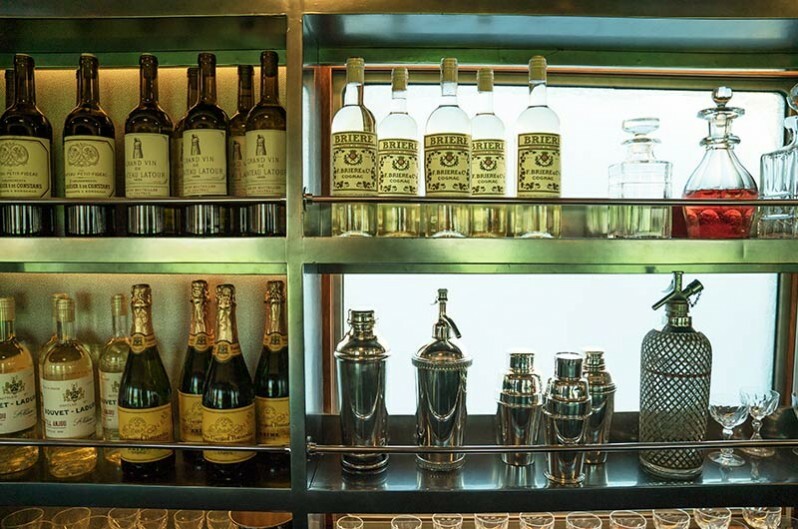 For example fine wines, cheese and meats from Paris, breads from the Slavic countries and a vast selection of fruit and vegetables from Istanbul—all based on detailed research from the 1930's Orient Express menus and linked with the countries with whom they traded.